Lacey is a city of 42,400 people in Thurston County. It is located in the northern section of the county, just east of Olympia, in western Washington. 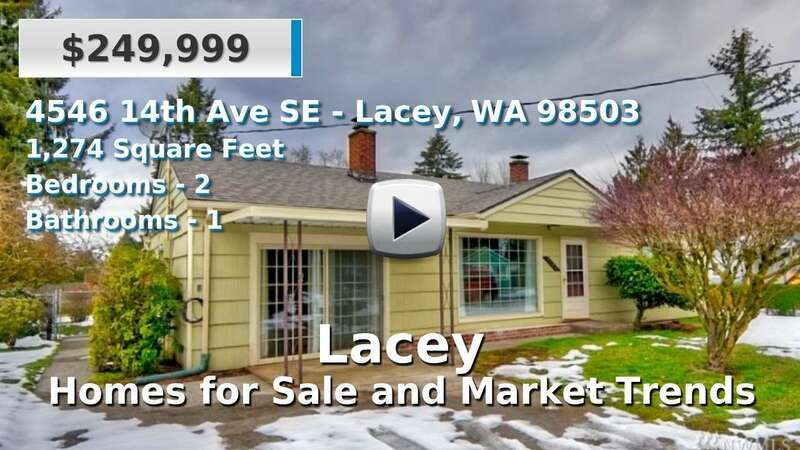 The average home for sale in Lacey has 2-3 bedrooms and was built in 1991 or after, newer overall than the rest of Thurston County. It has become a popular suburb for commuting to Olympia, Tacoma, and Joint Base Lewis-McChord; the average commute here is 24 minutes. The North Thurston Public School system in Lacey is the largest in the county. Lacey is also home to Saint Martin’s University, a Catholic liberal arts college founded in the late 1890s. This city has hundreds of acres of regional parks and walking/biking trails. The 3,700 acre Nisqually National Wildlife Refuge borders Lacey to the east and within the city limits is Tolmie State Park, a 105-acre recreation area on the Puget Sound. Almost everywhere you go in Lacey gives you a view of Mt. Rainier to the east or the Olympic Mountain range to the west. 4 Beds | 3.5 Baths | 3498 sq. Ft.
4 Beds | 2.5 Baths | 2075 sq. Ft.
4 Beds | 2.5 Baths | 2602 sq. Ft.
3 Beds | 2 Baths | 2171 sq. Ft.
4 Beds | 2.5 Baths | 1949 sq. Ft.